Chattanooga, TN ... Eggsercizer Resistive Hand Exerciser now is being packaged in a clear poly bag with a four-color, multilingual header card. The new packaging allows the consumer to actually squeeze the exerciser to test the resistance before making a purchase. "Because the feel is such an integral part of the product, we decided to switch to packaging that invites the consumer to squeeze the Eggsercizer before buying," stated David Maley, President of Magister. "Testing the resistance level, getting the feel of how the Eggsercizer fits in the palm of your hand...that's important to the consumer." Ergonomically shaped to fit comfortably in the palm of the hand, Eggsercizer can be used to strengthen fingers, hands and wrists. Specialized exercises are performed simply by squeezing the soft, smooth egg-shaped object. Eggsercizer provides highly effective, localized exercise that can improve finger and hand strength, fine motor control and flexibility. 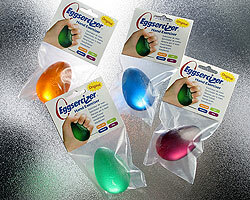 Eggsercizer is so small and easy to use that it fits into a pocket, bag or purse for use any time and anywhere. Part of the new packaging is the multilingual header card, making international distribution of Eggsercizer simpler. Product resistances are listed in seven languages: English, French, Spanish, German, Italian, Swedish and Norwegian. In addition to Eggsercizer, Magister Corporation manufactures a range of products for the rehabilitation and orthopedic markets, including REP Band Resistive Bands, REP Band Loops, REP Band Tubing, and Cambion Visco-Elastic Insoles and Heel Cushions. For more information, contact Magister Corporation. REP Band, Eggsercizer, and Cambion are registered trademarks of Magister Corporation.